A union that represents many Dallas County Schools bus drivers says it will challenge the firings of 13 drivers and the suspensions of 229 drivers who racked up hundreds of tickets for running red lights and even running past the stop arms of other school buses. Dallas County Schools is responsible for transporting students at the Dallas Independent School District and about a dozen other area school districts. The violations were first revealed Tuesday in an NBC 5 investigation which showed for years Dallas County Schools had done nothing to hold those drivers accountable despite a policy that said they should be suspended for first and second offenses and fired for the third offense. The United Labor Union, Local 100, said Thursday that administrators at Dallas County Schools (DCS) are to blame for the traffic violations. Local school districts expressed shock and disappointment Wednesday, after an NBC 5 investigation revealed hundreds of school bus drivers racked up tickets for running red lights and even around other school buses' stop arms. Union organizer Kenneth Stretcher said DCS runs a thinly staffed school bus operation where schedules are so tight drivers are forced to speed. "The drivers are put into a situation where they have to be at a certain place at a certain time," Stretcher said. "If you want these drivers to drive carefully you can't put them in a situation where you have to speed or where they have to take short cuts like that." In a statement DCS management fired back, saying, "There is no acceptable excuse for red-light running. That's true for DCS or in a court of law. DCS relies on its drivers to report any necessary route adjustments that they encounter." Stretcher, the union organizer, said he agrees some of the driving in the videos is concerning. But he says firing the drivers is unfair because drivers were never told they had racked up multiple tickets until this week. NBC 5's investigation found for more than two years DCS had simply paid the red light tickets and never tracked down the drivers responsible, until NBC 5 Investigates questioned why. NBC 5 Investigates uncovered hundreds of school bus traffic violations, resulting in the firing of 13 bus drivers and suspension of 229 more. North Texas parents react to the findings. The union says that delay robbed drivers of a chance to correct their behavior until it was too late. "And this is just a management fault here, a management breakdown they needed to address by not firing the drivers but by firing the people who failed to manage their program properly," Stretcher said. DCS has demoted two high-level managers for their role in failing to follow district policy. But the union wants those managers fired. The ticket scandal alarmed parents and administrators at school districts where kids ride DCS buses. 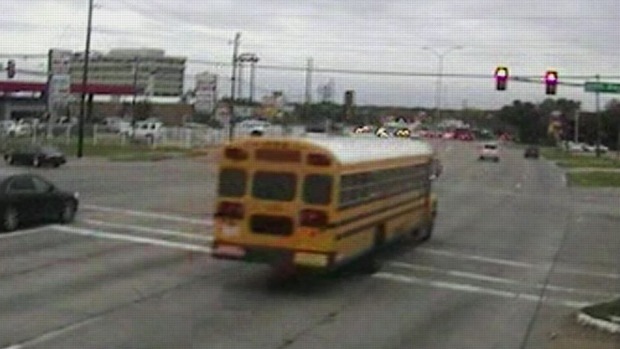 Videos of school bus drivers running red lights angered officials at the Dallas Independent School District, the biggest district to contract with DCS for busing. A top Dallas ISD official said Thursday that the district will consider the ticket scandal as it decides whether to renew its bus contract with Dallas County Schools, which is up in February. An NBC 5 Investigation found Dallas County Schools bus drivers breaking the law, running red lights hundreds of times across North Texas. "It's unfortunate that it's happened and it's unacceptable to our school district," said Scott Layne, chief operating officer at Dallas ISD. Layne said he was pleased so far with the actions DCS has taken in response to the scandal. "I only hope that from this point forward they'll have the proper checks and balances in place to prohibit this from happening again," Layne said. On Friday morning the first of the DCS drivers fired will appear at a hearing, challenging that decision. There is still no exact time line on how DCS will carry out the suspensions, ranging from five to nine days each, of more than 200 drivers – about 10 percent of the workforce. Dallas ISD said it has received assurances that the suspensions would be staggered over time and would not impact bus scheduling.